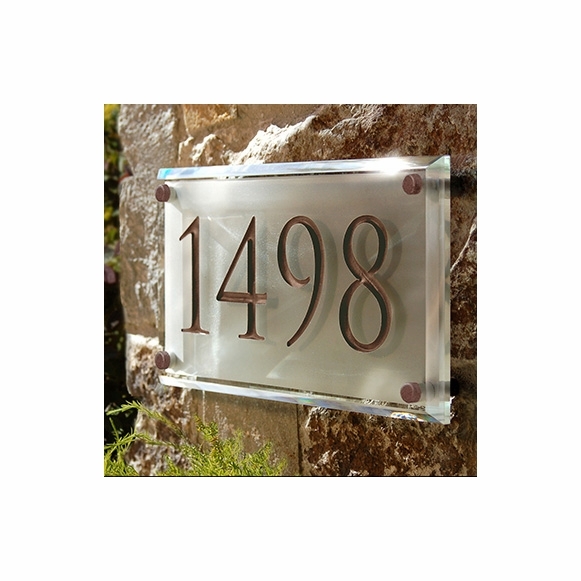 Engraved Crystal Address Plaque - - personalized with your house number. Wall-mount rectangle house number sign holds up to six numbers and a street name if desired. House number is deep-carved into the crystal and then painted. Made from 1/2" thick crystal with finely polished, beveled edges. The back side of the crystal plaque is a high-contrast frosted white to enhance visibility. Four decorative mounting pins position the plaque 1" from the wall. Crystal plaque holds one or two lines of personalization. Character size varies depending on configuration. A one-line sign holds one, two, or three 4.25" numbers; four 3.5" numbers; five 3" numbers; or six 2.75" numbers. A two-line sign holds an eighteen (18) character street name on Line 2 with one, two, three, or four 3.5" numbers on Line 1; or five 3" numbers on Line 1; or six 2.75" characters on Line 1. Two distinctive fonts: trajan and futura. NEW! Crystal address plaques are now available with LED lighting. Click top two links in Related Products to purchase. Absolutely beautiful. Makes a statement of elegance. We love it. So glad I decided to do this for our house numbers instead of "the usual." Thank you to those who reviewed this product in the past ... your reviews helped sway me toward this option, and I couldn't be happier with how this looks on the front of our house. I did the white with black numbers and it looks spectacular. My husband loves it too!